On 27 October 2015 Google Inc was found liable for defamation published on Ripoff Report. I was subsequently threatened and ridiculed by Google shills such as Techdirt.com and others. 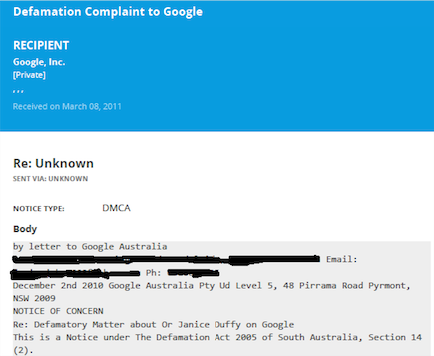 Ripoff Report optimised the defamatory content and Google did not remove it. I fought back and Google and its shills tried to break me. I think that they have finally succeeded. After the latest round of threats to my home I don’t want to live anymore. The following are screenshots of a document containing threats was subsequently put in my letterbox at my home. The police cannot do anything. It is impossible to trace who put this in my letterbox but I emphasise that I do NOT think it is one of the two Australians who have published on Techdirt and about whom I know the identities. I have stood up and fought back but I think the intimidation, ridicule and threats using the excuse of ‘Free Speech’ has won. I am tired of the harassment and fear. I am just tired! Google, their lawyers Ashurst, their shills such as Techdirt.com, Lumen Database and Ripoff Report have finally broken me. I wake up shaking in fear and go to sleep crying. This is no way to live. I spent Christmas Day curled up in the local park crying. My dad is very ill and was sleeping. I realised then that this battle has alienated me to the point that I don’t think I can go on.